I really am a terrible blogger. Somehow I've managed to completely fail to mention all the knitting I've been doing. When we moved to Melbourne, I started working as a consultant and was fortunate enough to have a terrific mentor who has been coaching me along the way and providing fabulous professional support. She's also a seamstress, knitter, quilter, textile designer, and lover of vintage. She loves knitting and when she found out that I couldn't knit she decided to teach me. It was ideal for me as I was finding it difficult to sew with fibromyalgia and my usual "couch in front of the TV" embroidery was proving too much for my hands. Knitting was a good fit. My first project was a scarf. My mentor gave me a pair of needles and four balls of yarn. The first couple of rows were a bit dodgy as I was learning tension and the art of ending the row with as many stitches as you started. Eventually though the scarf was just a long rectangle in stocking stitch which I finished in early 2011. It's nothing fancy, but it certainly got plenty of wear during my first Melbourne winter! Once I got the hang of the basics, I was off and definitely bitten by the knitting bug. It was great to have projects that I could pick up and put down whenever I liked. I started having multiple projects on the go, some that I needed to pay attention to in order to follow the pattern and others that I could do without looking. I soon figured out that I could knit all manner of things, not just for myself, but for friends and family. The first piece of "knitting for someone else", was a scarf I made for my good friend Escheresque. It was a rib pattern, worked in a lovely muted green yarn made of soy protein of all things. The rib pattern had some mathematical significance. Escheresque has a love of mathematics and the scarf was X* stitches long and the rib pattern alternated Y/Z*. Unfortunately I was so happy I finished it (rather belatedly as a birthday present), that I posted it before I took any photos. I will have to ask Escheresque to take some photos for me. This was one of those projects where I spotted the yarn first and immediately thought "Mum would love those colours". I'd remembered my Mum had commented that she liked scarves in winter, but as a teacher found they often came undone and got caught on things while she was working with the kids. 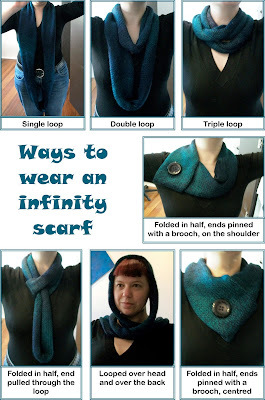 I'd seen a couple of infinity scarves around Melbourne and knew they were simply a scarf that is joined at the ends to form a big loop. The infinity scarf I made for Mum's birthday was a straight stocking stitch worked in a wool/acrylic blend yarn that had lovely purple, blue, green graduated tones. I bought a brooch made from a large button to go with it. 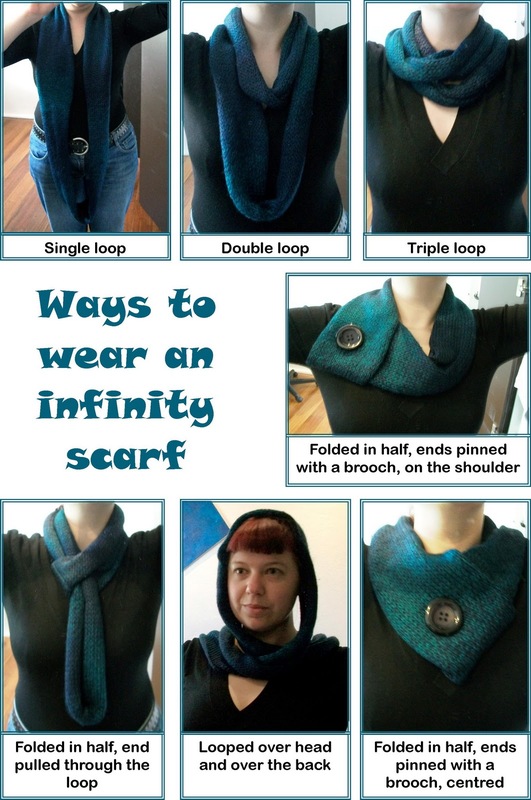 I also made a little instruction sheet for Mum showing some of the different ways the infinity scarf can be worn. So that was 2011 - The Year of Knitting! There will continue to be more knitting in 2012. After having made a series of gifts for friends and family, I'm currently back to knitting some things for myself. This year I plan to tackle knitting garments and venture into the sweater and cardigan territory. Maybe even dabble in some vintage knitting patterns. Most of all, I plan to actually blog about them as they are completed.